Why Does My Cocker Spaniel Chase Shadows? Why Is My Cocker Spaniel Chasing Shadows? Hello, We have recently rescued a cocker spaniel. He is about 18 months old and has started to chase his own shadow. Is this a common trait and do you have any suggestions to break the habit? Chasing shadows (also known as a canine compulsive disorder) is an obsessive compulsive behaviour in canines. Other compulsive behaviours can be excessive tail chasing (spinning), snapping at imaginary flies and excessive paw biting or licking. This is something that needs to be dealt with immediately otherwise it will only get worse. Behaviours such as these may be triggered by several things, but can often be helped with a little training and patience. I recommend you speak to your vet for advice. He or she will probably give you a step by step training procedure to help stop this behaviour and, depending on the severity of his obsession, he may also prescribe medication to help calm your dog down. The sooner you begin treatment, the sooner he'll be on the road to recovery. 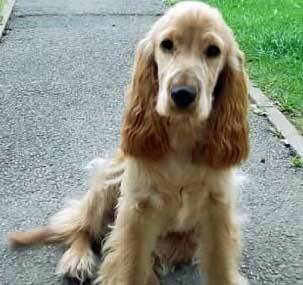 Is it possible that your Cocker Spaniel was trained with a laser light or that a laser had been used as a 'toy' for him to chase? Lasers can sometimes cause this effect in dogs, especially those with a high prey drive. Boredom and/or a lack of exercise is also a possible reason for his repetitive behaviours. If he's exercised already, I recommend you increase it - double it if you can. Your dog needs to be stimulated, both mentally and physically to stop him becoming bored. Play games with him, take him to the park and throw a Frisbee or a ball. If he's left on his own all day, that won't be helping his situation. Leave him with a friend or neighbour during the day, or arrange for someone to pop in every couple of hours and take him for a little walk or play with him. There is also the possibility that your dog is attention seeking, possible because he's bored. It's important you don't scold your dog for chasing lights and reflections as he can't help himself. Don't give your dog any attention as you may be unwittingly reinforcing his attention seeking behaviour. The next time you catch your Cocker shadow chasing, need to distract him immediately. Make a loud noise and clap your hands to distract him, turn around and walk out of the room. If he doesn't follow you, go back into the room and try again. He will eventually follow you. When he does, praise him and give him a treat. Play with him, give him his favourite toy to play with, or take him for a walk - anything to distract him from chasing shadows. When you're out walking with your dog, don't let him focus or obsess on shadows. For example, he may catch sight of his own shadow or a reflection and may begin to obsess. If he does, stop walking with him and stand still. The minute he looks up at you to see why you've stopped walking, praise him and walk quickly away from the spot. Keep him distracted with praise and a treat and continued walking/playing. This behaviour won't disappear overnight, it may take a few days (depending on how obsessive he is) and it may return; a sharp, moving reflection may trigger his compulsive desire to chase it. If that happens, begin the exercises again. The most important lesson to come away with here is to keep his mind and body stimulated and well-exercised. I've seen this type of behavior lots of times and it's really sad because it's obvious the dog is disturbed. I don't know what causes it, but I suspect it's brought on by boredom. My old dog Rex had a problem. He chased his tail. At first I thought it was funny, but it soon escalated into a real problem. I wasn't able to deal with it myself. I had to pay a trainer to help him snap out of it. Sadly, Rex is now no longer with me, but I learned a lot from him. When I'm ready to get another dog, I will know what signs to look for so that it doesn't happen again, and I'll never ever let it get bored. I'll stay home for longer and I'll train it properly. I guess I wasn't really ready for a dog in the first place and poor Rex got the brunt of that.